The market topped the key 33,000 level multiple times on Tuesday, but closed below that threshold after rising inflation numbers squeezed the headroom for an interest rate cut at RBI's policy review next month. Inflation at the wholesale level raced to a 6-month high of 3.59 per cent in October, fuelled by food articles, data released today showed. Retail or CPI inflation, which came on Monday, had jumped to a 7-month high of 3.58 per cent in October. 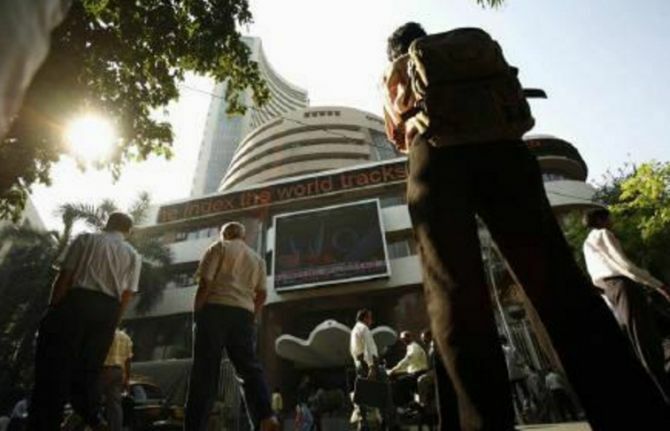 Not sure which way to move, the Sensex changed its course many a time during the day, before it settled at 32,941.87 -- a three-week low, down 91.69 points, or 0.28 per cent. The index had a fall of 281 points on Monday. The broader 50-share NSE Nifty met with the same fate, dropping 38.35 points, or 0.38 per cent, to close at 10,186.60 after shutting between 10,248 and 10,175.55. "Rise in inflation numbers and weakness in Asian peers blunted the expectations of a recovery and domestic market remained range-bound. “Persistent weakness in the rupee also weighed down investors' sentiment," said Anand James, chief market strategist, Geojit Financial Services. Analysts say jump in Brent crude price to nearly $64 has also dented the chances of a rate reduction at the Reserve Bank's December policy meet. Uncertainty over US tax reform, slowdown in Chinese factory output and growing political issues in the UK weaned investors away from placing more bets. L&T bled the most, falling 2.46 per cent, followed by PowerGrid, Asian Paints, TCS and ONGC. Hero MotoCorp, Axis Bank, Bajaj Auto and M&M counters, however, saw buying activity. The loss in BSE capital goods was maximum at 1.41 per cent, followed by telecom, infrastructure and PSU. Share sale by foreign portfolio investors (FPIs) was worth a net Rs 233.58 crore yesterday, provisional data showed. Domestic institutional investors (DIIs) also let go of shares net Rs 268.77 crore. Weakness rubbed off on broader markets, with mid-cap and small-cap indices falling by up to 0.22 per cent.